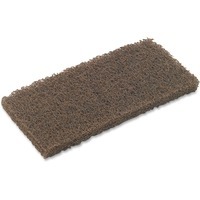 Scrub 'n Strip Pad is designed for tough jobs like removing finish and wash buildup for baseboards and floor edges. It's a great way to strip stairs. Floor scrubbing pad is made of polyester and nylon fibers in an open web construction. Uniform coating throughout every pad reduces the number of knots and clumps. Pads will not be significantly affected by water, detergents, or cleaners normally used for floor maintenance. Use with the swivel pad holder system to reach floor areas not accessible to standard floor machines. Each pad fits 3M Doodlebug Pad Holder 6472 or Handblock Pad Holder 6473.